There are some toys that children just can’t live without. When it’s holiday time or if you are visiting friends or family, favourite toys are sometimes left behind. This wonderful fold away Zoo is easily packed away and carried wherever whenever. There are some toys that children just can’t live without. When it’s holiday time or if you are visiting friends or family, favourite toys are sometimes left behind. 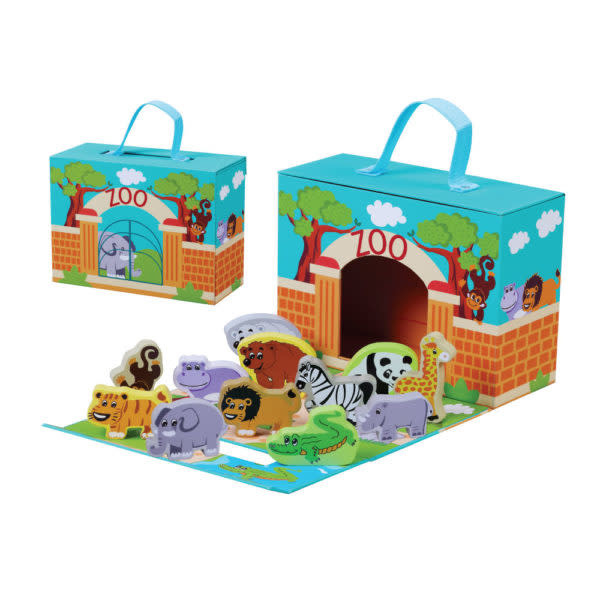 This wonderful fold away Zoo is easily packed away and carried wherever whenever. Children will enjoy arranging the wooden figures to create their own story with our variety of people and Zoo animals. Casing is cardboard and shuts magnetically ,carry handle is a strong woven material, all 12 pieces are wooden. Includes; Monkey, Tiger, Elephant, Hippo, Lion, Bear, Polar Bear, Zebra, Panda, Giraffe, Rhino, Crocodile.